"It seems like change is on the way," Pressley said to raucous applause at her election night party. "Ours was truly a people powered, grass-roots campaign. ... that dared to do what Massachusetts Democrats aren't supposed to do." There is no Republican on the ballot in this Democratic bastion — an urban district that encompasses Boston, Cambridge and surrounding suburbs, much of the area once represented by a young John F. Kennedy, and now often called the "Kennedy seat." Capuano is only the second Democratic House incumbent to lose a primary this midterm season, the first was New York Rep. Joe Crowley, who lost to Alexandria Ocasio-Cortez. Congressman Michael Capuano, a Democrat from Massachusetts, has been in office for nearly two decades. He's pretty popular at home, and yet he could not win his primary race yesterday. Ayanna Pressley beat him. It was yet another upset by an outsider candidate. With no Republican running this fall, she is set to become the first black woman representing a district from New England in Congress. Pressley said last night it seems like change is on the way. NPR's Asma Khalid has been following this story, and she's with us in our studios in Washington. Hi, Asma. ASMA KHALID, BYLINE: Hey, David. GREENE: So you both cover politics for us, and you live in the Boston area. So you know a lot about this. What do you make of this outcome? Was it surprising? KHALID: It definitely was surprising, David. And I say that for two major reasons. One is that Mike Capuano had a lot of institutional support. You know, there was the Democratic Party operation that was supporting him, but also he knew that Ayanna Pressley was going to be a formidable challenger. So he had gone out and gotten the support of the Congressional Black Caucus PAC and the support of Deval Patrick, who's the state's first African-American governor. So I mean, that was part of it, right, that he had a lot of this support. But the second thing is, he also just had a lot of money. And you look at polling and, you know, I did not see a single poll that had given Ayanna Pressley the lead. And if you look at the final results, she came out victorious by about 18 percentage points. GREENE: Wow. I mean, the polls just weren't predicting that in any way. How did she do it? KHALID: You know, part of what her campaign has spoken about is that she had a lot of institutional grassroots support, you know, which is really different than the party institutional support. She was knocking on doors and out in neighborhoods. And the other thing is, David, she's a really phenomenal campaigner. I have covered a lot of candidates, and early on, I told my editor that she was just a really sort of charismatic speaker and able to energize a lot of people. GREENE: What does - I mean, I know she brought up the idea of representation in the party and in politics. What kind of role did that play as she was trying to get voters to be with her? KHALID: Yeah. She's spoken a lot about this. This is the only majority minority district in the state of Massachusetts, and Ayanna Pressley had made the argument that it's not just about Democrats winning, it's about who those Democrats are. And, David, to me what was really interesting is this is yet another sign of sort of the strength that we've seen of African-American female candidates. You know, we saw Stacey Abrams, who's the Democratic nominee in the state of Georgia. We've seen Jahana Hayes, who won her district in Connecticut. Ilhan Ohmar in Minnesota. I mean, the list sort of goes on and on. And you've seen these African-American women who've been really successful not just in majority districts of people of color. GREENE: So what is all this telling us about the Democratic Party going forward? KHALID: That, I think, is a really good question (laughter). And I think that maybe what we learned last night is a little bit better of a signal than what we saw, you know, with the Alexandra Ocasio-Cortez victory in New York. 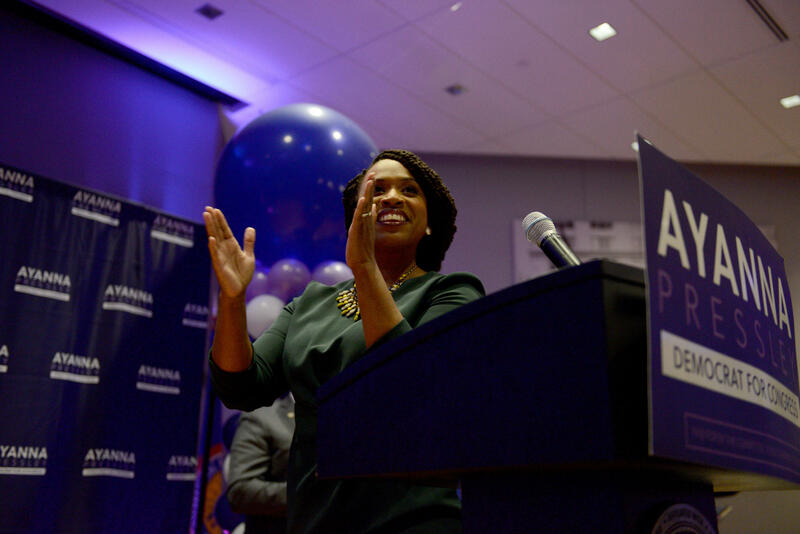 And part of that is because Ayanna Pressley grew up in Democratic Party institutions. She wasn't really a party outsider. And maybe one of the things I think we are learning is that there are, you know, districts like this Massachusetts 7th where people are trying to reassemble the Obama coalition and prove that you can have African-American voters as well as white, liberal, highly educated voters and reassemble them together, and it seems like Ayanna Pressley was able to do that. GREENE: OK. Surprise, fascinating night in the state of Massachusetts last night. NPR's Asma Khalid telling us about it. Thanks so much, Asma, as always.